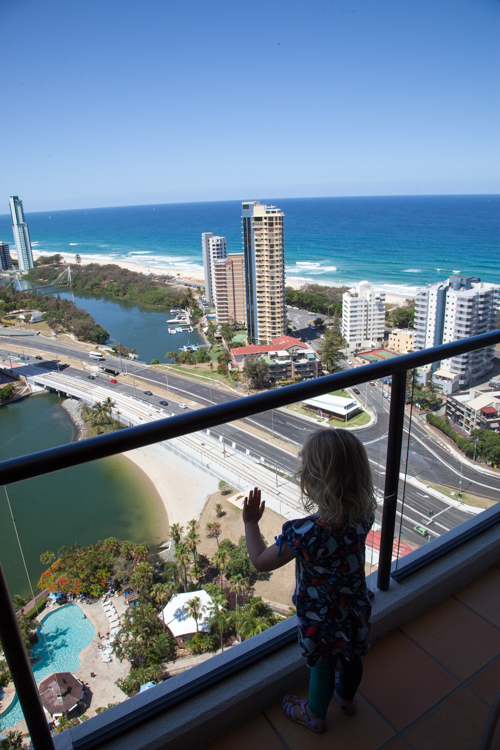 Surfers Paradise Marriot Resort & Spa: Queensland's Best Kid-Friendly Hotels - Adventure, baby! 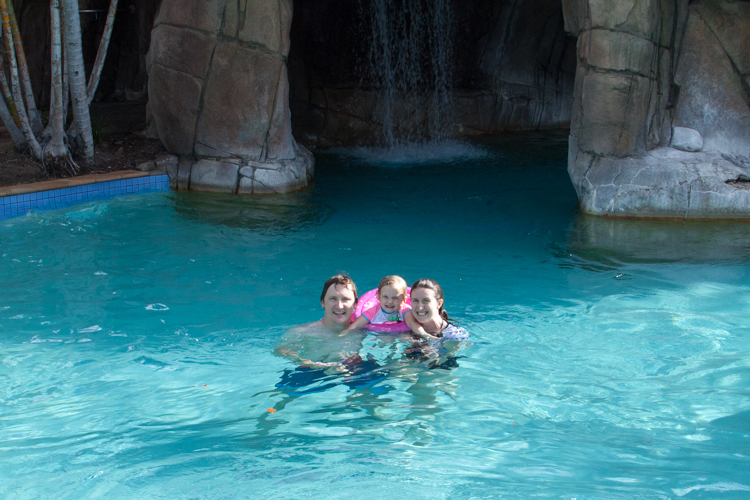 When you have a three year old, your holidays are a little different than they were pre-kid. My needs in accommodation, for instance, have changed significantly. 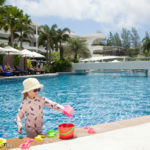 What I now look for is a fantastic pool, close proximity to the beach if we’re on the coast, a suite of some kind so we can close the door to our sleeping child after we put her to bed and watch some TV together while we eat, breakfast included and friendly, considerate staff. The last one obviously is pure luck. 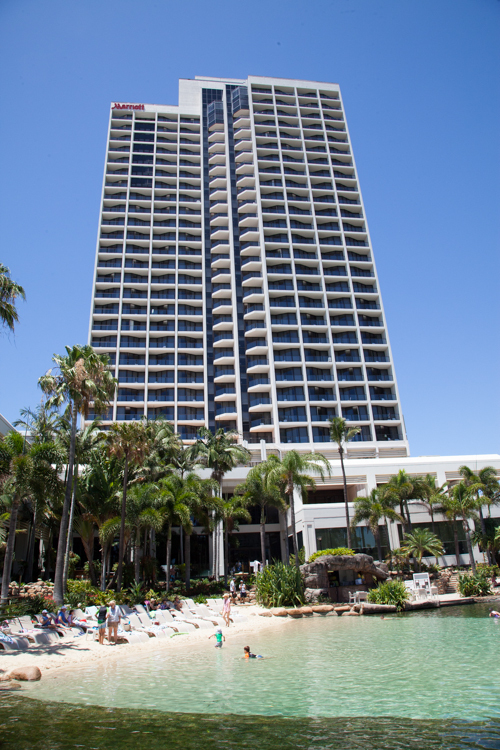 The others, I discovered through extensive research, were all features of the Surfers Paradise Marriot Resort & Spa. 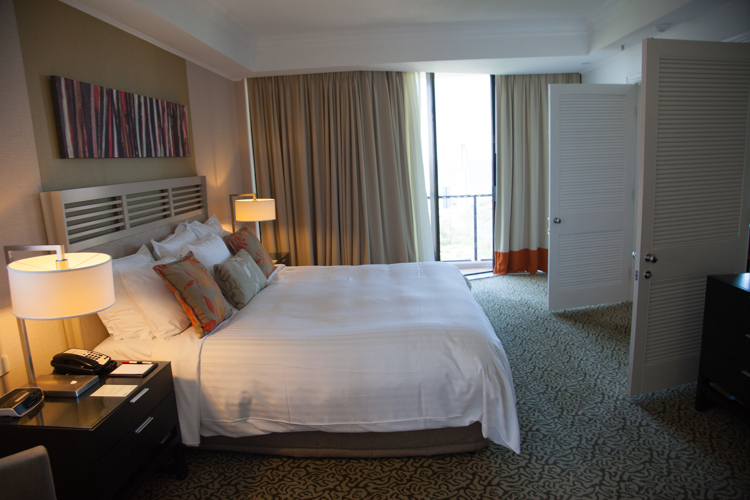 As members of the Entertainment Book, we were able to get a great deal on a 1-bedroom Executive Suite. 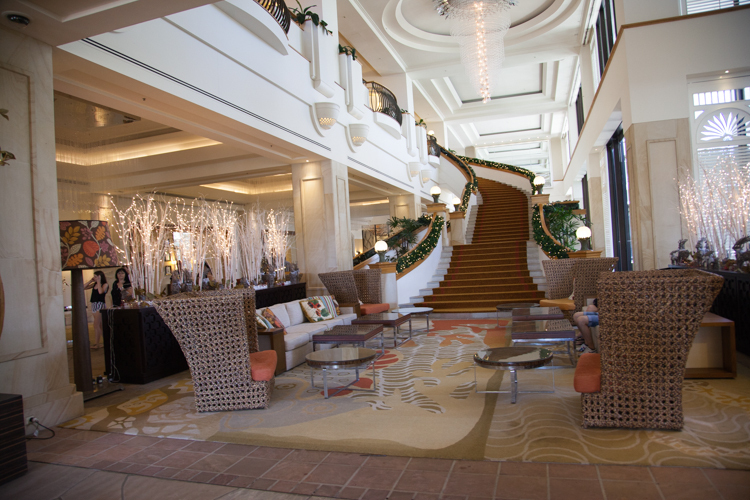 It included a king sized bed (we asked for a rollaway bed for Cheese), 1.5 bathrooms, a corner ocean view, complimentary valet parking and access to the Elandra Retreat Club where we were treated to a complimentary continental breakfast every morning, and wine and hors d’oeuvres in the evenings. 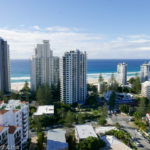 First impressions of the Surfers Paradise Marriot – it’s a large hotel, only one or two blocks from the beach, but also right on a lagoon, so it’s basically surrounded by water on all sides. 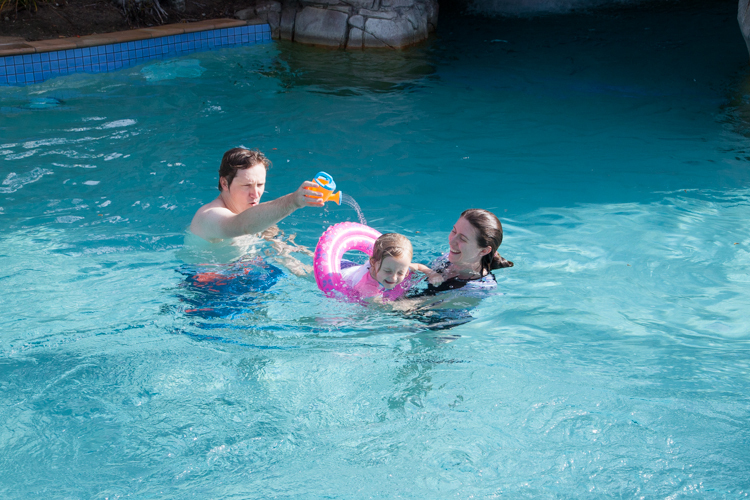 The pool is a huge drawcard for families, probably because they have not just one pool, but two. 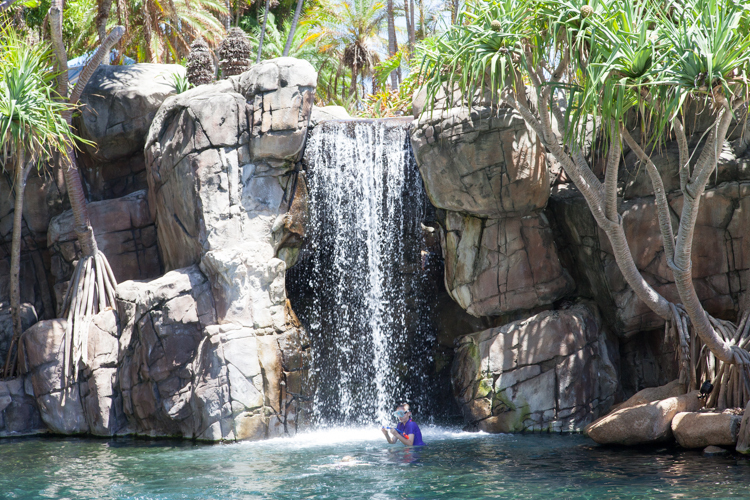 One is a saltwater pool that has live tropical fish in it and a waterfall feature. 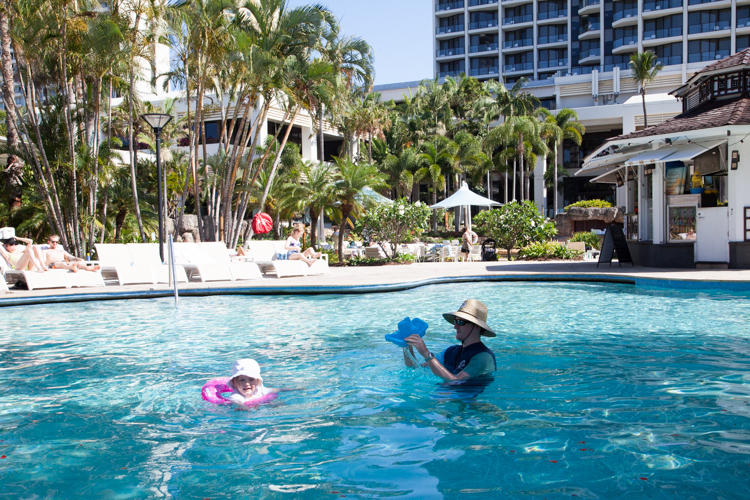 Guests can swim among the fish – BYO snorkel or buy one at the hotel. 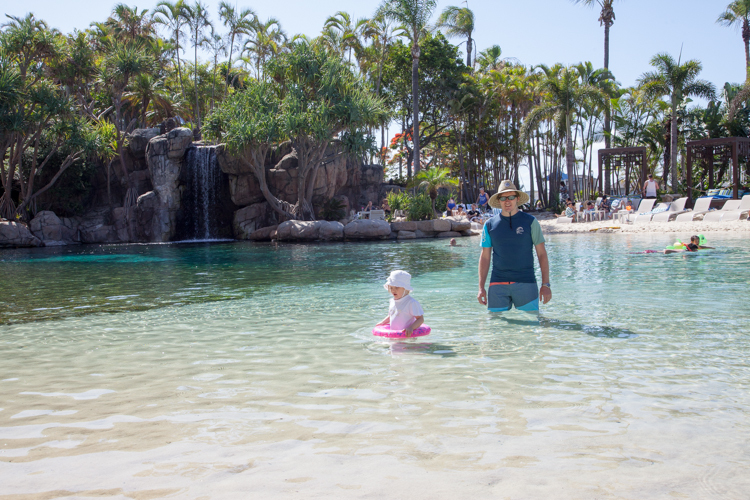 The salt water pool is fantastic because it had a large shallow area, perfect for little kids who can’t swim yet to be able to splash and play confidently in the water. 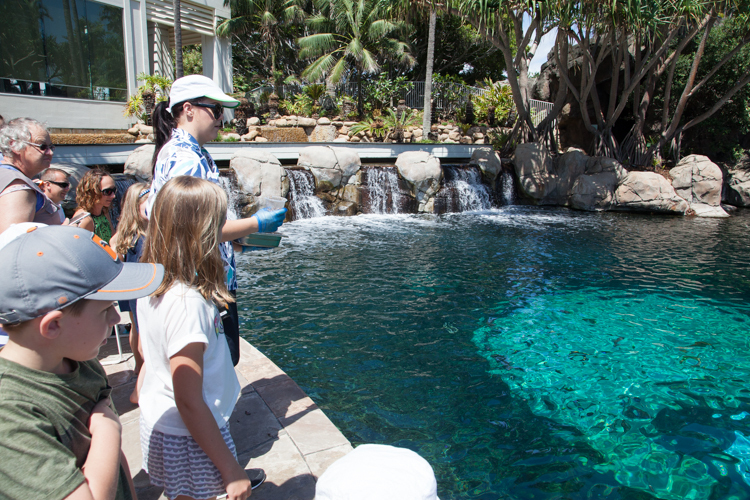 Every morning at 9:30am, guests can meet poolside to watch staff feed the tropical fish. 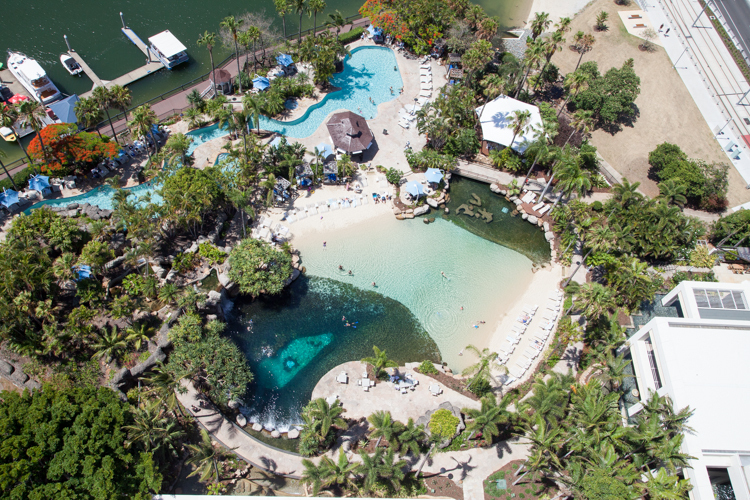 Guests with snorkels can watch from the water as the fish gather in big clumps for their morning feed. 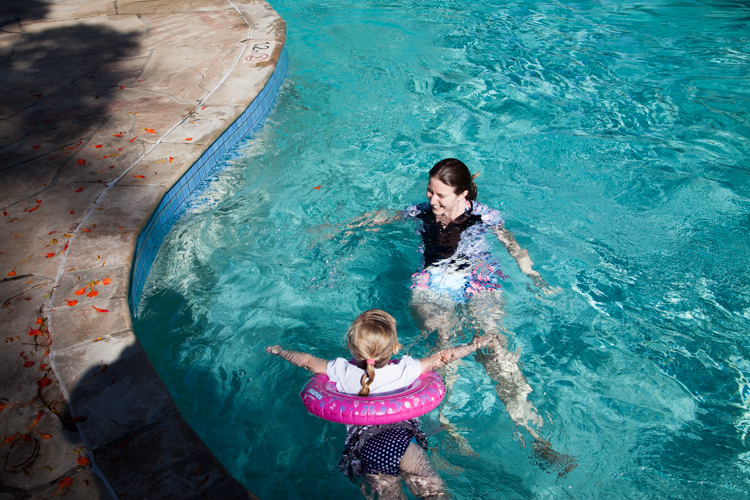 The second pool is chlorinated and runs in a long, winding shape. 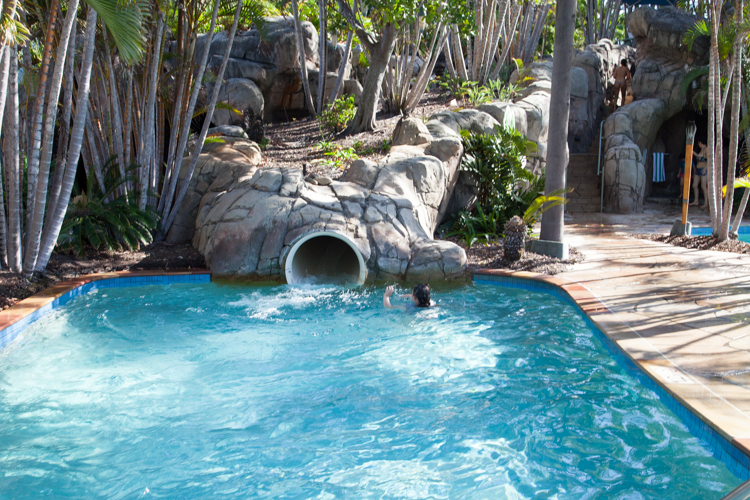 One end features a grotto with spa – you can enter it through another waterfall. 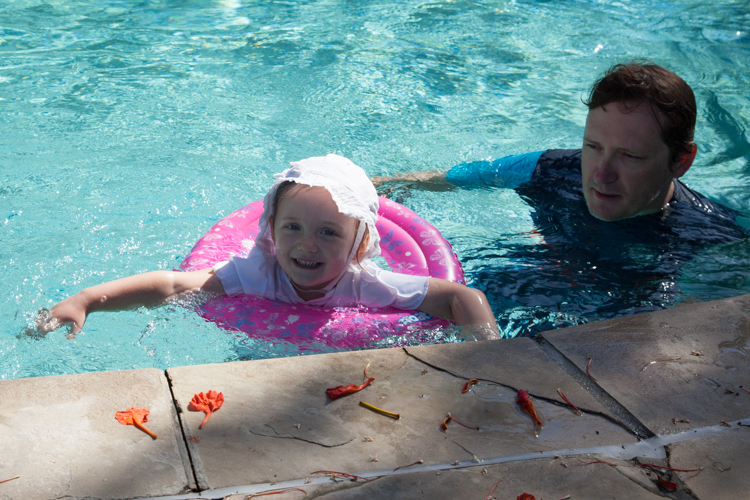 This pool also has a current that sweeps swimmers in a loop – a lot of fun for kids in floatation devices to get swept around the pool with zero effort. 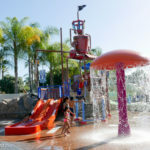 Older kids will enjoy the water slide feature, too. Our room was fantastic. 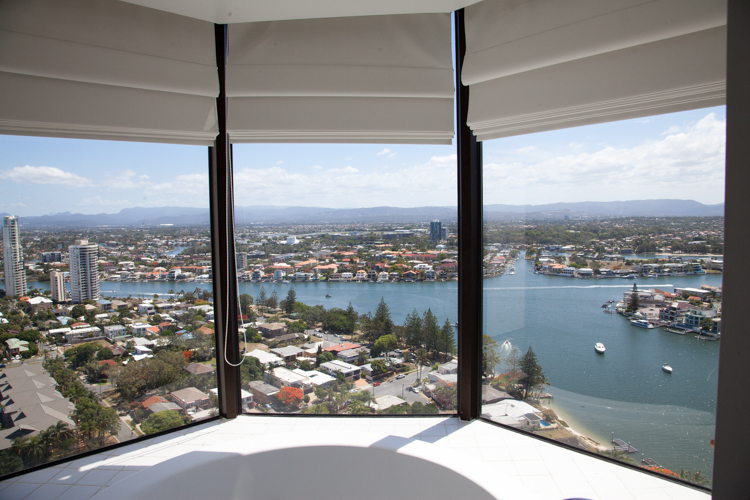 The view from the living room, bedroom and even bathroom was spectacular. The bedroom and living areas were well furnished in an elegant, minimal fashion. 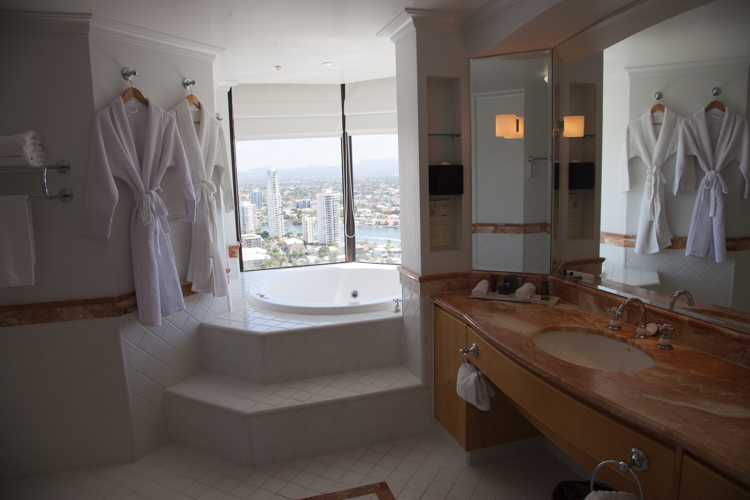 The bathroom was spectacularly big and featured a massive spa bath with a killer view. 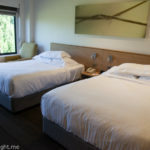 The bed was comfortable, pillows a little on the soft side for us, and the only bad thing I can say about the facilities was that while most of the bathroom had been renovated, the shower was a bit old and could have done with a refurbish. The living room included a little kitchenette area which was great for preparing basic meals for Cheese. A little fridge, sink and tea/coffee-making facilities – no toaster though. Since Cheese is an uber picky eater, most nights we would return to the hotel and make her a simple dinner like a sandwich and fruit, and then, after she was put to bed, either order room service or local takeaway. The hotel was great with providing us with extra plates and cutlery to make her meals each day. 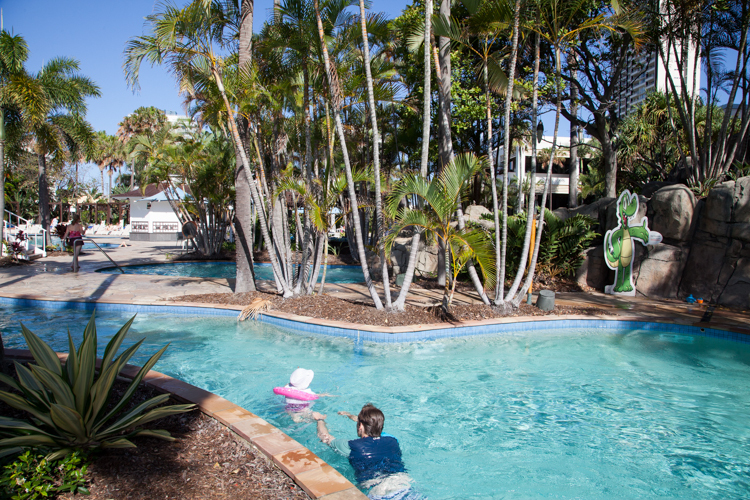 The inclusion of the Elandra Retreat Club access turned out to be one of the best parts of our stay. A lot of the guests who also had access to the club also had kids, so each morning we would arrive at breakfast and Cheese would disappear to play with other children while we ate. The food was a simple buffet, all fresh, including breads and spreads, warm pastries, bagels, meats, yoghurt and fruit, plus hot dishes like eggs, tomatoes and hash browns. Two staff members were usually on duty each morning – usually the same two – and they were just the sweetest people we could have possibly hoped for. The staff were always so kind and considerate, and really enjoyed engaging with the kids. As a result, breakfast every day was a really fun experience. 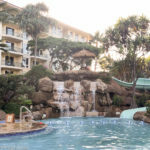 In the evenings, from 5:30pm – 7:30pm, the Elandra Retreat Club held a kind of drinks hour, with complimentary wine and snacks. While I was concerned initially that this wouldn’t be the best idea to take a rambunctious 3-year-old to, it turned out that all the families came and had a drink while their kids downed the cheese, crackers and fruit each night. 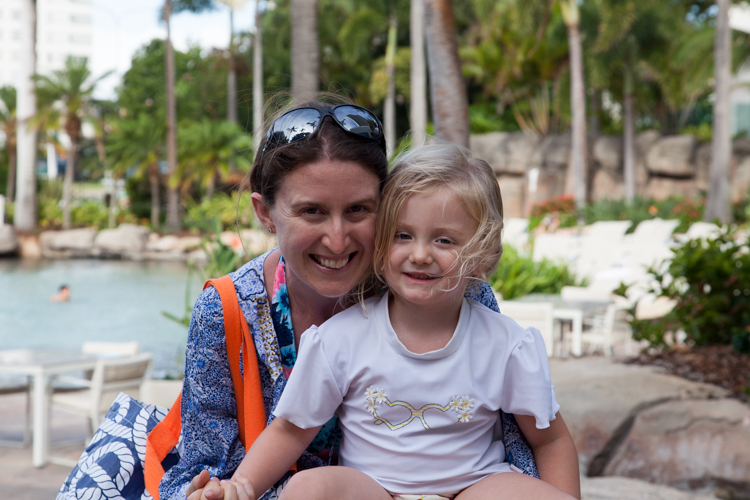 It was a pretty chilled out affair, and the club had a great layout that meant adults who wanted a bit more adult time rather than toddler time could sit far enough away that they could admire the view and enjoy a drink in peace. 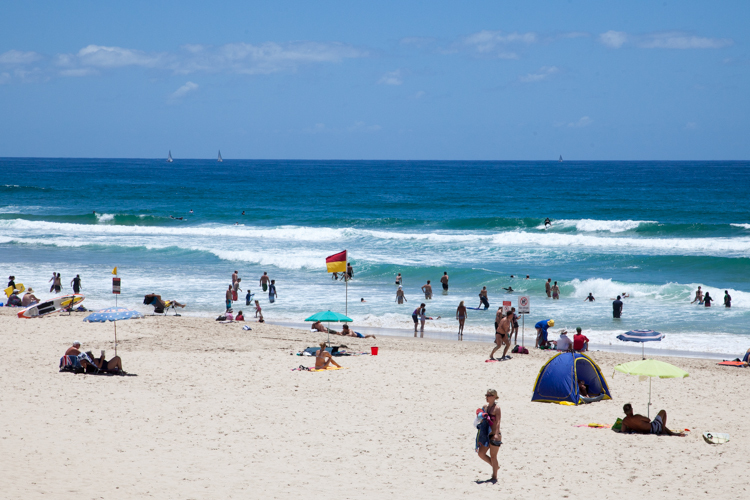 During the day, when we weren’t swimming we headed on down to the main area in Surfers Paradise (a 10-15 minute walk) to grab lunch or took a trip to one of the nearby theme parks for a change of scene. 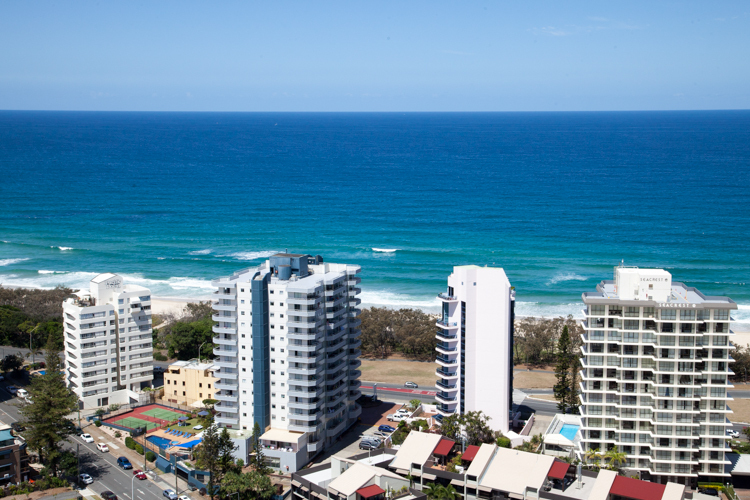 The location was perfect for an extended stay on the Gold Coast. 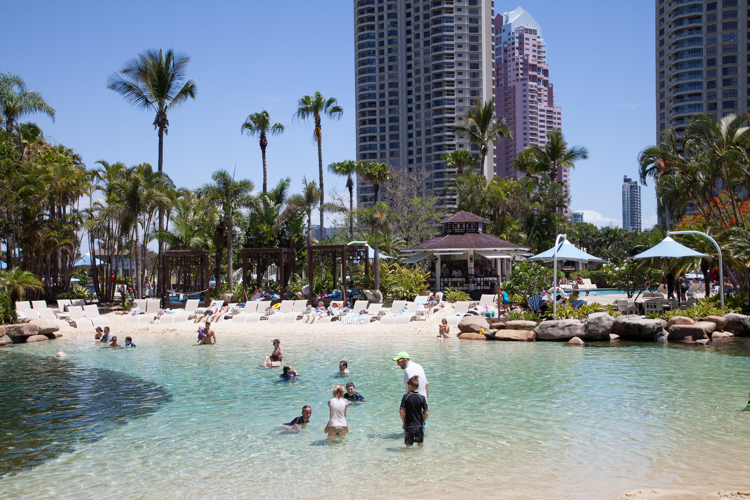 To sum up, our stay at the Surfers Paradise Marriot Resort & Spa was just about perfect. 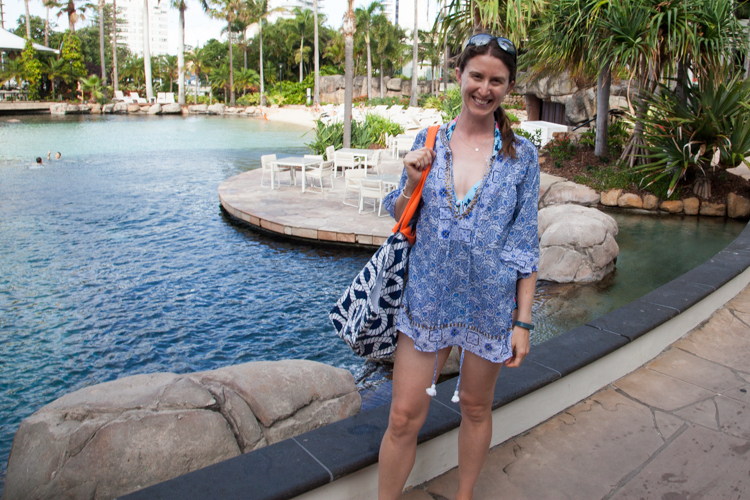 We had such a wonderful, relaxing and fun time, and can’t wait to return for another Queensland stay.